Poll: Should I use this option? I am officially announcing the discontinuation of this mod. The fact is, I have just lost interest in the mod. This is partly due to the fact that the changes in 1.3 required me to essentially go back and start from scratch with many of the features, and even drop some of those features you guys have come to love. I am not blaming the 1.3 update, I just feel it is time to move on. But fear not, there is an alternative. 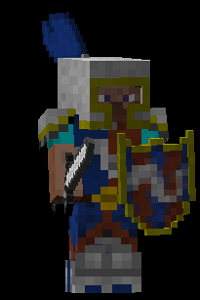 Please go over and have a look at JadeKnightblazer's Asguard Shield Mod. 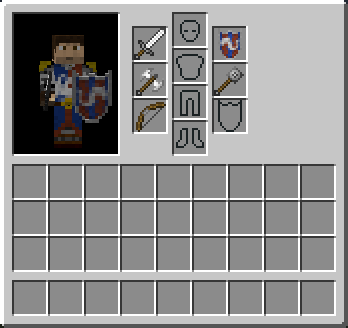 Over the coming weeks Jade and I will be working close together to integrate some of the code from this mod (mainly how I render shields in the offhand) into his mod. I see this is a win/win/win. A win for me because a small part of Battlegear can live on in Jade's mod while having the free time to work on my new project. A win for Jade as he can use some of this code to help make his mod really stand out and possibly also learn some of the rendering code. And a win for you guys as you still get a very functional and aesthetically pleasing shield mod. I would also like to thank you guys, my fans for helping make what this mod what it is today. There are some of you who have been following this topic for a very long time (some from when the mod was just a shielding mod) and some who have only been following recently. But through your comments, suggestions and bug reports you have helped me turn the mod into something I never expected when I began coding it all those months ago. So I would like to say thank you. Finally, for any of those who would like to continue following my work. I have created a new topic for Mine & Blade: Commander. For those that do not know, Mine & Blade: Commander is a new mod I am creating (or re-creating) that will allow you to create, customize and order an army made by NPCs. I will be using some of the features developed for this mod for the NPCs in M&B:Commander (eg sheathing & shield rendering). Right now I have only the basic rendering, customization and spawning of the 1st unit (The militia) which has over a mind boggling 20,000 different customization combinations. At the time of writing there is currently no download avaliable as the soldiers do little more than just stand there. However I will provide one if there is a high demand of people wanting to use the bots to populate a world simply for atmosphere. Also expect a video demonstration soon showing off the Spawing interface as well as the customization in action. Mine & Blade: Battlegear implements an entirely new weapon system to minecraft. Pressing the 'I' button or clicking your player character in the Inventory screen will bring up the Weapon Inventory Screen. The 3 different weapon sets can be switched using the mouse wheel. Items displayed in the following table are able to be placed in the weapon slots. There is an option in the config file to allow the use of weapons from other mods. Mine & Blade: Battlegear adds a number of new weapons to the game. The waraxe has the special ability of having a chance to cause 150% damage to mobs. Red sparks will fly around the mob to indicate extra damage. The mace has the special ability of having a chance to cause a 3 second stun to enemy mobs. Blue sparks will fly around the mob to indicate stuns. *Note: The spears must be made with a undamaged quaterstaff. Note that this is just an example. When a shield is equipped shield blocking is activated by holding the right mouse button. While in blocking mode, all damage from mobs is ignored from the front 180 degree arc. In addition movement speed is slowed. Blocking mode cannot be sustained indefinitely as it drains your "blocking timer" based on the shield you are using. The blocking timer apears in the bottom left corner. Using a sword while blocking will make the bar go down slower (by 25%). Shields can be enchanted in the same way as armour. The enchantments however have very different effects. 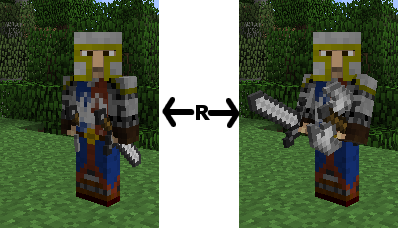 Knight's armour is a new armour set that has the protection and durability between that of iron and diamond armour. 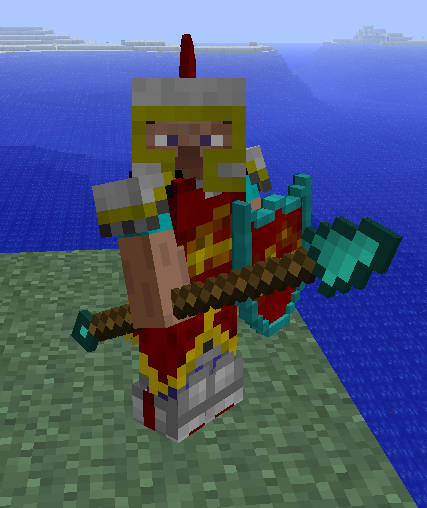 It however is quite expensive to make requiring a full set of iron and chain armour as well as a few blocks of wool. 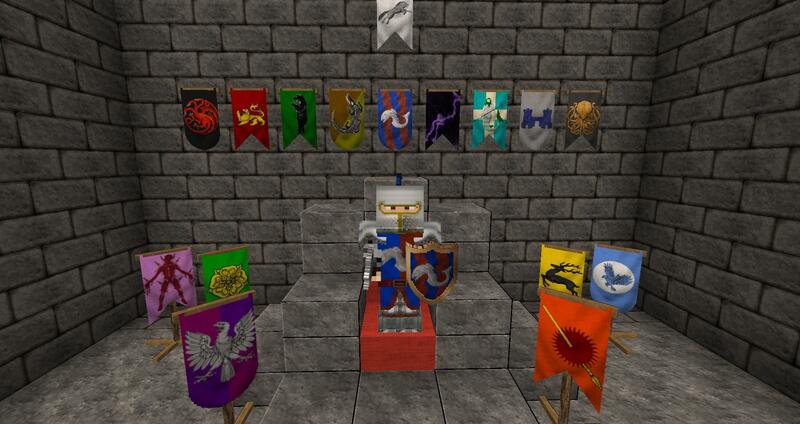 Knight armour comes in 16 different colours corresponding to the 16 different minecraft colours. 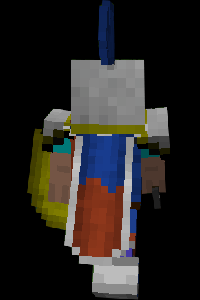 Knight armour can also be dyed to change its colour. Knight armour includes a plume on the helmet as well as a custom cape on the chestpiece. Shield bashes will cost 1/2 the amount of stamina. 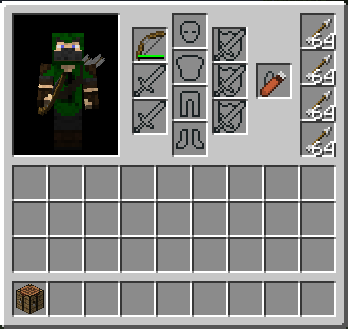 Placing the quiver in the quiver slot will open 4 new slots in your battle inventoy for arrows. 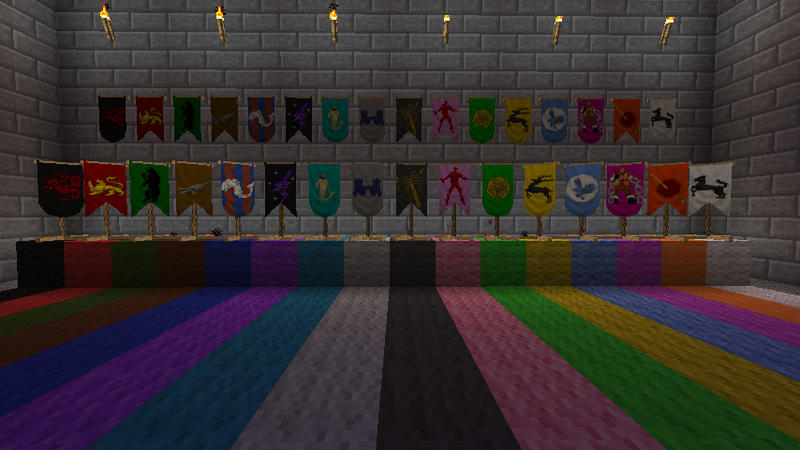 Banners are the 1st of my purely decorative blocks. They come in 16 colours and can be placed on the ground (and will face you) or against a wall. Mine & Blade: Battlegear takes advantage of Vazkii''s amazing Mod Update Manager. This means whenever I issue an update, you will notified in game and linked to this page. You do not have to do anything else. Also do not install Modloader after Forge, Minecraft Forge now contains it's own modloader that is backwards compatible. Read the [goto='FAQ']FAQ[/goto] the [goto='Bugs']Known Bugs[/goto] and the [goto='Comp']inompatibilities[/goto] sections. Q: I found a bug, incompatible mod crash or blackscreen, what should I do? A: First Read and follow all of my crash 101 post. What other mods you are using. Weather or not you are using minecraft forge and what version of Forge you are using. Note: If you do not provide ALL this, I will likely just ignore your post or report it as spam. Q: Where is the config file? A: Depending on how the mod is coded, some may already work. In most weapons from Balkons Weapon Mod will be flagged as weapons and therefore useable in battlemode. For weapons that do not work, there is an option in the config file to add the item ids of custom weapons. Adding item ids to the cofig file (currently named "Mine & Blade.ini" and generated after you have 1st run the mod) will flag items as weapons. Ids should be seperated by comma-space. This however will not flag the weapons as duel wieldable, it will only allow them to be recognised as weapons and thus useable in battlemode. There is no way to make some weapons duel wieldable as they have a right click function. Note: There is a bug in the config file for the 2.8.0.1 version so this function currently does not work. It will be fixed again in the next version. Q: Why can I not dual wield all weapons (eg weapons from Balkons Weapon Mod)? A: The mod will scan any item flagged as a weapon. If that weapon has a special function on a right click (other than blocking) it will flag the weapon as non-dual wieldable. You will therefore not be able to use the weapon in your off hand, with a shield or with another weapon. This is so there is no coflict with a weapons right click function and CANNOT be changed. This is the reason you will never be able to dual wield many of Balkon's Weapons or certain gun mods which generall use the right mouse button to fire the weapon. Q: Where is the link to the Mine & Blade: Battlegear file? Sorry for all the secrecy, I have had many problems with people not reading the important parts of the main post. If you got this far I am happy that you have demonstrated your ability to read and (hopefully) follow basic instructions. Q: Can you add my idea for a weapon? A: No, This is not intended to be a weapon mod. It is quite unlikely I will add new weapons any time soon. Q: Can I use your mod as part of my mod pack? PM me to let me know you are using it. I may not have a chance to reply and if you agree with all of these terms, I really don't mind and will not ask you to take it down. I just would like to know that you are using my mod. Q: Can I add texture pack support for your mod and if so can I use your textures as a base? Q: When will SMP be ready? A: It will be ready when it is ready. I won't even start looking at SMP until after 1.3 is released. Even then it will take me a long time to get everything working. Q: Why can't I see offhand weapons in 3rd person? Q: Why did you just report me? A: I have begun reporting everyone who posts questions that are answered in this post as spam. I am sick and tired of re-answering the exact same questions that are answered here. Q: I love your mod, how can I donate? A: Please do not donate, I do not do this to make money in any form (which is why I don't use adfy links). If you do have your heart set on donations, please send you money to one of the many worthy charities, they could do many greater things with the money. One example of this is Elemental Arrows. As a rule of thumb try to keep away from mods that edit base classes. Keep Items: We both use the same method to make our changes to the inventory, resulting in each mod constantly replacing the ineventory eventually resulting in a crash. There will likely be some issues with mods that either edit the player model in some form, or preform special rendering with the weapons. Crashes with "java.lang.IllegalArgumentException: Slot 211 is already occupied by...."
Minecraft has stopped running because it encountered a problem. OpenGL: ATI Radeon HD 5570 version 4.2.11631 Compatibility Profile Context, ATI Technologies Inc. This just means that you have a block ID conflict. Go to the config file (Location is .minecraft/config/Mine and Blade.conf) and change the number next to the BannerID variable to something else (between about 200 & 250) until you no longer get a crash. Java: 1.6.0_30, Sun Microsystems Inc.
VM: Java HotSpot™ Client VM (mixed mode), Sun Microsystems Inc.
OpenGL: AMD Radeon HD 6530D version 4.1.10834 Compatibility Profile Context, ATI Technologies Inc.
You didn't install PlayerAPI. Next time actually READ and FOLLOW the installation instructions. This is only a quick texture pack I whipped up to go along with the x64 pack I generally use (download). To isntall just extract the files into your favourite (x64 or higher) texture pack. Pleasew note that I am not the best texture artist. Others could do a much better than I at high res textures, I just wanted to give it a go. This looks amazing. I've been wanting a shield mod exactly like this. You made it happen, good job . Will you make this mod separate from Battlecraft? I already have a lot of mods installed and I'm not sure if they will be compatible with Battlecraft. This looks amazing. I've been wanting a shield mod exactly like this. You made it happen, good job :smile.gif:. Yeah, thats why i made a second topic. However the mods GUI features will be more tightly integrated into my battlecraft mod. But I knew some people would want this without the other features of battlecraft. I would of course recommend you try Battlecraft also. This isn't in in yet though. this looks amazing, any idea when you will release??? oh and one more thing, how come you dont set it so that the shields can be right clicked to protect? or will it be optional?? With out a doubt. THE BEST ****ING MOD EVER!! DOWNLOAD IT NOW!! Actually I am about to re-do the main post, change a texture or 2 and upload an initial release. I couldn't be going through the whole closed beat test thing and doubt it will break anyone's game. But I should warn you before installing. I will of course also require feedback on block times and durability. Once this is out, I'll probably make some alternate textures for the people who want more vanilla textures. Also, are you going to release the raptor mount mod thingy as a seperate mod too? Just asking. GENERATION 27: The first time you see this, copy it into your sig on any forum and add 1 to the generation. Social experiment. Ok Guys Beta 1 release is out. Let me know any Issue, Bugs, Suggtestions or Balance Tweaks. Although I should warn you it is beta and therefore could be buggy. Yeah thats no problem. I can add it to the texture pack list if you want. I probably will but don't hold your breath on the whole raptor mounts though. I might do that for this. Although I think I will have to edit base classes for that. I don't know if it would be worth me struggling with finding workarounds again. First to download ftw . I found a serious bug, gonna upload a pic, one sec. ps. Ignore that guy in the background, that's from the friend mod. Wait, sorry , when i said the guy in the back ground, i meant the guy jumping. The one wearing the shield is me. Discovered the cause of this glitch. It's an incompatibility with Smart moving mod. You should put that in the OP. There is also another minor rendering issue where in 3rd person view the models armour will not move with its arm. Yep I'll put it up there. There is also another minor rendering issue where in 3rd person view the models armour will not move with its arm. Im pretty sure it was working fine for me. Let me check. Also be aware, if you're in a dark place, for example a cave, and then place a torch so it's lit up a bit, the shield will be black/dark. Test it out, i can't really explain it. That would be because i essentially re-wrote the renderer. I'll see what I can do about fixing it. I really need a pic of it. Also do all of these only happen in 3rd person view?